When Ros first voiced her intention to bid for a ring that certainly had her attention and interest, I wasn’t sure how to respond. We are still grappling with the intricacies and antiquity of the skulls and bones that recently appeared, but as for metal ancient artefacts residing in Australia, our knowledge is minimal and the current tally was one with the reasonable expectation that it would stay that way. As much as the photos of the object did ask questions, there was already a ready-made rebuttal lurking in the shadows that appear whenever an unusual artefact is found that doesn’t seem as if it fits. Whether a coin, metal object or jewellery, the stock response is that it was accidentally dropped or mislaid at some time after the Invasion. This mantra is the inevitable explanation that automatically denies any credibility. Even if the coin is dated and manner of manufacture ancient, it is always down to a careless carry or hole in the pocket. But once purchased with some facts known, there are a variety of reasons why this routine dismissal cannot apply. What, where and the depth of retrieval of this ring, are all in opposition to any accidental drop or frayed lining of the pocket. When reading the written explanation supplied by the prospector, it becomes obvious that this artefact was first covered in soil tens of thousands of years ago. Bearing a high-tech metal detector at the gold-fields near Hill End, this person made a conscious decision to ‘go bush.’ Scrambling up a fairly steep slope on the side of a mountain, he pushed through low scrub with the detector at the ready. Once close to the submerged ring, the machine responded and the prospector started digging. His expectation of something close to the surface was unmet, and more than once he downed tools and placed the detector above the deepening hole. Something was there, but further down. At around one and a half metres contact was made, covered in sediment and much smaller than expected, his first thought was that it was merely a metal bottle cap. 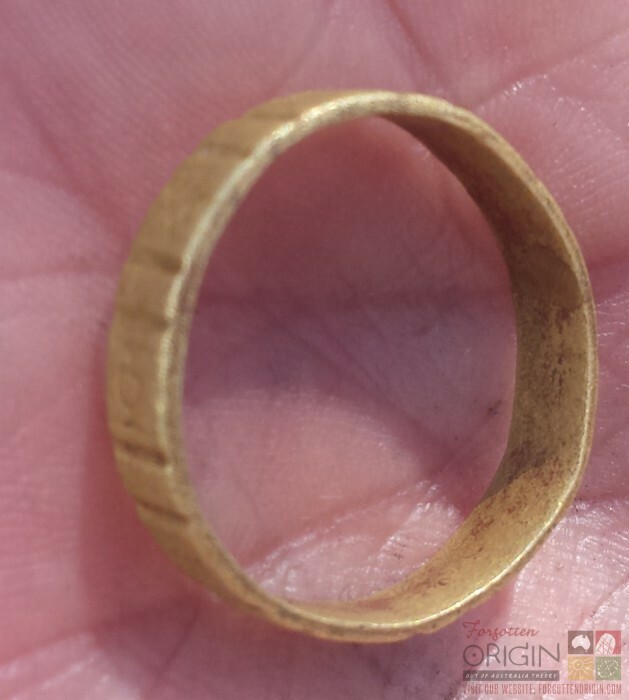 It was only when this find was cleared did he realise that not only was it a ring, it also had a golden coat which deserved a closer look. The ring was examined and tested for precious metals. In that endeavour the results were disappointing, there is not one gram of gold within, with over 99% being an alloy of copper and zinc. The complete roll call was as follows: Copper 73.96%, Zinc 25.57%, Lead 0.276%, Nickel 0.120% and Iron 0.073%. It wasn’t gold, but zinc that made the golden sheen, which led to this assay being done. But what was missed in translation, was both the vital importance of the three trace elements that made up less than half a percent, and what is just as important, the depth at which the artefact was found. *It was found away from the gold field up the side of a steep slope lacking in a path. After scanning the entire mountain, this was the only hit he got, so as a commercial prospect this is a barren area. Deposited so far down (150 cms) immediately rules out any activity that occurred since Cook. This depth demands a solid five-figured date. *If we did mistakenly assume it was recent, perhaps the ring-bearer fell in this hole. It was here that the ring was unknowingly dislodged from his finger, and soon after the hole was covered up. Such ring-wearing behaviour runs counter to those times and clientele. Male gold miners, are almost entirely drawn from the lowest levels of society and do not wear jewellery, and certainly not rings. *If this ring-wearing male was a rebel, or perhaps driven by the need make a fashion statement or to dress like a woman, the area near and around the Hill End gold fields 150 years ago is the wrong place to make bold personal statements. Moreover, if this urge to adorn jewellery like a woman did not moderate, the fact that the ring is so narrow in diameter means that irrespective of strong the need to put the ring on, it will not fit. I am just on 60 kilograms and it is too narrow (diameter >2 cms) to fit over the thumb, first or second fingers of either hand. No, this ring is designed for, and worn by, women. And they never worked on the actual gold fields. *If there was any very thin male in the vicinity with a proclivity towards wearing rings, necklaces and the like, the one place he would not be wearing these adornments is anywhere near where men were digging and panning for gold. Residing in the nearest town, possibly, the case could also be made for a stately manor or theatre, but never in the bush away from any signs of culture or fashionistas, except for blokes with pans and shovels. 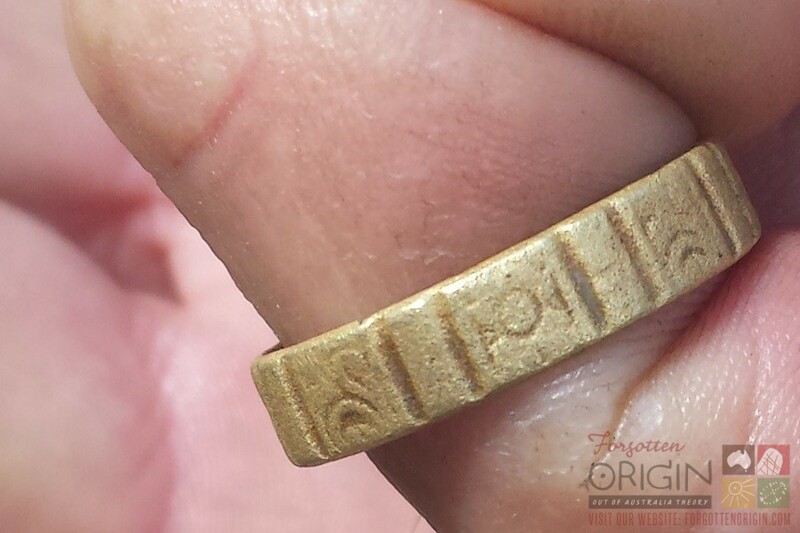 *If it is a recent implant, why is it that the two engraved symbols have no connection to any British or European script? Ros has good reasons for seeing a relationship to Berber designs, but as for any resemblance to the invading motifs and symbols, to this date, we have found none. *Not only the inhospitable positioning but the fact that there was nothing else with the ring is of note. Normally personal effects are interred with the person who wore them, never away from everything way out on their own. That is all he found, and being so isolated and alone, only asks more questions. *Of all these questions, the one most prominent and pressing relates to the five elements that make up this ring. Without a doubt that roll call is incredibly ancient and lacking in a direct entry through any computer. On every other occasion, information gathered via the computer and facebook is passed on to me by Evan. Never before had I ventured unescorted on to any web site or electronic portal of information. But he wasn’t there at the time when an urgent need to look further arose, so with expectations set as low as the bar could descend, I ventured forth with five words entered in the search box. The elements that make this alloy are in order: copper, zinc, nickel, lead and iron. My intention was to check out the top scientific reports and papers on this alloy and thus narrow down dates and locations. Alas, I came up blank, no matter how I rephrased and jinked the search words, the best I got was four of the elements, never all five in consort. There was absolutely nothing in any accredited academic source, but that is not to say there was no response. Wikipedia (a source we have never referenced until now) did have a name, locale and detailed ancient historical accounts. But the trick is that all of this took place, from start to finish, well before Jesus was born. It is very old news, as these ancient reports were primarily second-hand accounts of events passed on to them. For reasons best kept to ourselves, we place no stock or credence in anything cited from Wikipedia, but the irony is that since there is nothing else we could find written or researched on this chemical alloy, we have no choice but to travel further down Wikipedia Street. We can take some comfort in that most of what is reported relates to information given by Plato and Pliny the Elder, whose reputations are far less tarnished. 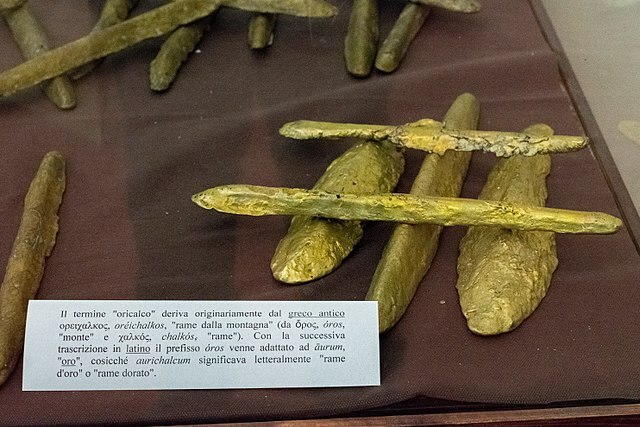 The two major elements of Orichalcum are specifically referred to in many writings, but as to what else was found in the alloy, the final answer was hidden until the recovery of a shipwreck with Roman coins aboard found at Gela (Sicily) in 2015. The “golden bronze alloy used by the Roman Empire for their sestertius and dupondius coins”(3) was analysed and found to be “made of an alloy primarily consisting of copper, zinc and smaller percentages of nickel, lead and iron.”(4) That elemental stock-take is identical not only in name but positioning from most to least, as it is in the ring. In what only confirms this ancient metallic bond, the metal analysis of the coins had percentage counts of around 75% copper and 20% zinc. The ring has 73.96% copper and 25.57 % zinc, which is virtually the same except there is a slight elevation in the amount of zinc, but what is of note, is that the lesser three contributions are both listed in the same order. The importance of this ring, on both a commercial and mystical level, cannot be understated. 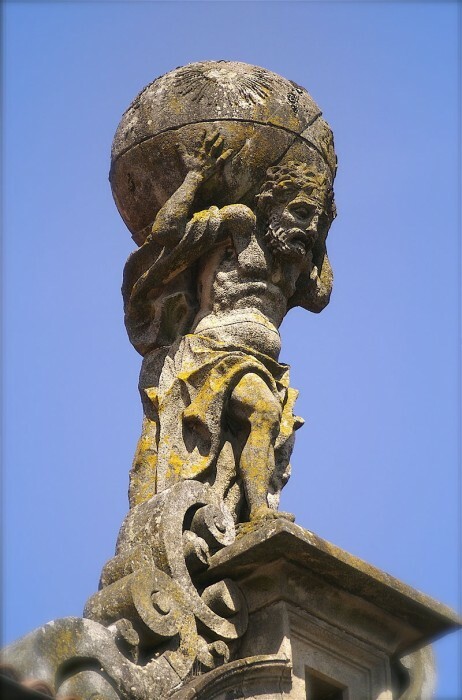 According to Plato, as recorded in Critias, “Orichalcum had been considered second only to gold in value and had been found in many parts of Atlantis.”(5) What needs to be fully appreciated is that this ‘value’ extends beyond every monetary measure. “The three temple walls of the Temple of Poseidon and Clieto on Atlantis were clad respectively with brass, tin, and the third outer wall, which encompassed the whole citadel “flashed with the red light of Orichalcum.”(6) The crucial importance of this Temple is underpinned by the fact that of the many, perhaps hundreds of women Poseidon is reputed to have slept with, of all the many off-spring he is responsible for, he chose Clieto’s first son, Atlas, to rule over Atlantis after his reign. As this account continues, so too does the scope and embrace of this alloy breach the divide between the material and esoteric. “The outer walls, pillars and floors of the Temple were completely covered in Orichalcum. In the centre of the Temple stood a pillar of Orichalcum, on which the Laws of Poseidon and records of the first princes of Poseidon were inscribed.”(7) This ring has two symbols, which are as yet unidentified, could it be that these two engraved glyphs are also on the central pillar? What isn’t under question, is that every mention of this alloy is prefaced in the past tense. By “Critias’ time Orichalcum was known only by name.”(8) The reason why knowledge of this sacred alloy was fading is simply that, as “Pliny the Elder points out, Orichalcum had lost currency due to the mines being exhausted.”(9) And to this very day that exhaustion continues, no factory or laboratory has any knowledge or familiarity with the post-Jesus manufacture of this metal in any form. 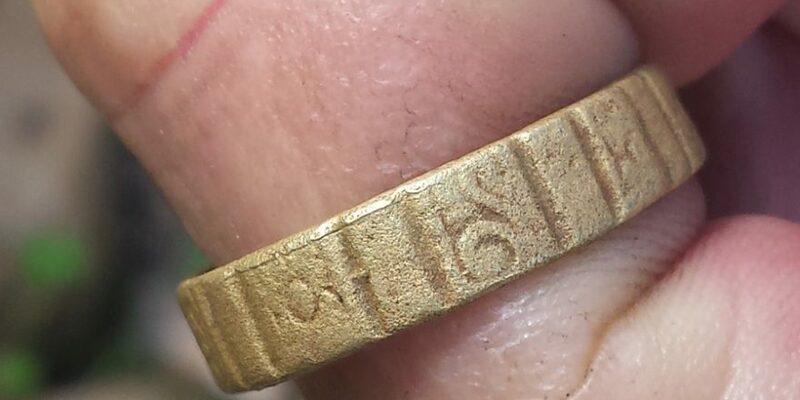 What that all means is that this ring is ancient, even by Roman Empire standards, so why was it resting one and a half metres beneath the surface in Australia? There is no way anyone working in those fields or remote diversions nearby would have such a rare, if not utterly unique, artefact in their possession. This is a global treasure, certainly not a shiny copper trinket worn to adorn while shovelling dirt. There are nine symbols, of which both are repeated five and four times. The more numerous icon is a circle, with two small vertical lines of the same length extending above and below, then intersects with a horizontal line. The other symbol also has the same upper and lower horizontal line, but what lays within is more like two unfurling petals. 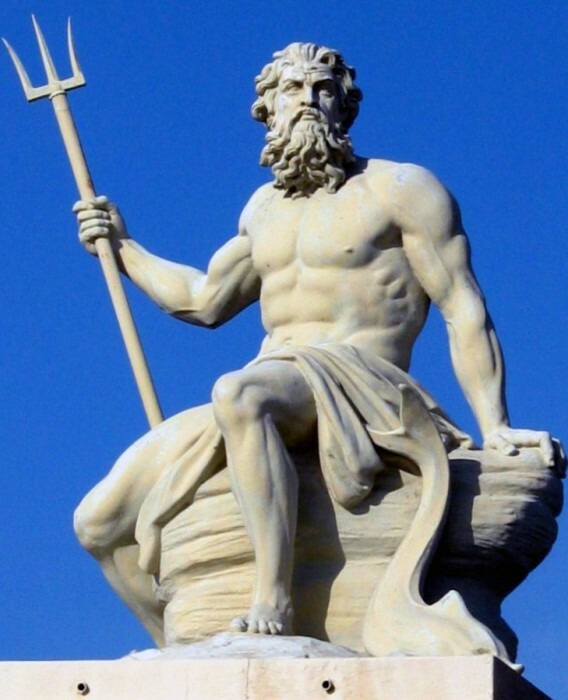 Knowing that this is the Temple of the male God Poseidon and his favourite human female consort, Cleito, whose son (Atlas) was chosen to continue reigning after Poseidon, it could be that these symbols are actual representations of that double stewardship. If this is a woman’s ring, this could mean the more numerous figure is female. The union of both genders could also mean that the male ring has the opposite equation, in that four engravings depict the unfurling male symbol. Speculation aside, there is some exquisite mathematic principles at play. With the exception of one intrusion, the patterning is exact. The other eight captions measure 4 mms x 4mms. The eight squares are flanked by a dividing blank rectangular space of 4 mms height and 2 mms in width. In each case, either figure is placed in the same position as the others of its form, the distance to each margin and size of the two icons never varies. Then amongst this exactitude, is a singular parting of the ways and extra addition. The ninth caption was originally five centimetres in length, before one line that breaks this pattern intrudes. One-third of the way across what could be the female icon the ring was cut through, an extra piece of what seems to be the same material has been inserted and joined. It is no more than 0.5 mms across and barely visible unless magnified, but to cut and paste at this level of sophistication at a place reputed to be eternally restricted to a stone, bone and stick technology, just doesn’t add up. If the ring was laid out flat and measured from the cut and insertion, its length is 55 millimetres, which comprises of eight sets of four-millimetre squares and the ninth, a rectangle one centimetre longer, are all accompanied by nine two millimetre dividers. That the circular symbol inside the largest shape is broken by this one off-cut and insertion, breaks the mould and setting of the remainder of this ring, and adds strength to the suggestion that this separation took place when the ring was made. On the inside of the ring is that reddish tinge in the Temple at Atlantis Plato spoke of, it runs along the lip with varying degrees of intensity, but it can be seen and validates one aspect of Plato’s account. This is not the first time that a metallic object exhibiting technology or constituents unknown today has come to our attention. 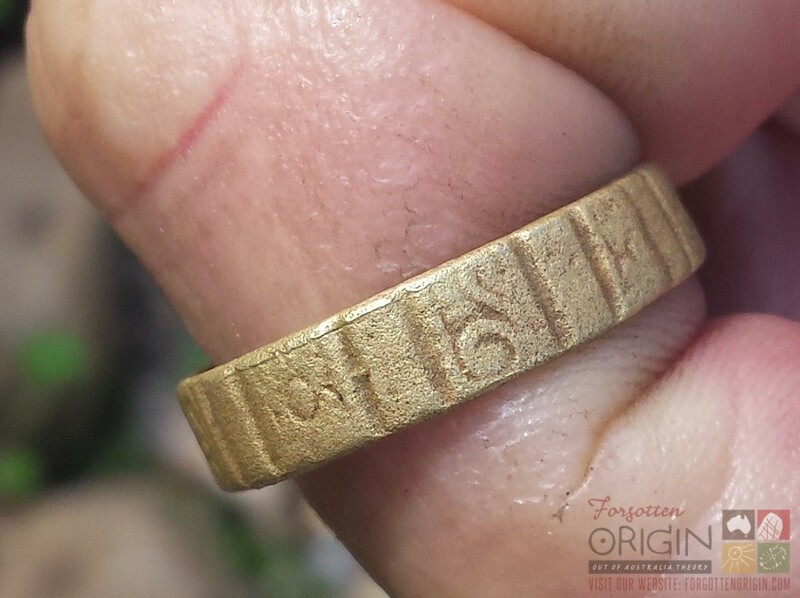 What makes this concurrence even more intriguing is the southern latitude upon which both the ring and metal jewellery found at Kariong Glyphs, share. Both artefacts were found on the same line of thirty-three degrees. A highly significant number in Masonic quarters, is this shared line of latitude is merely another of one many supposed coincidences or is by design? Before passing a verdict, a quick refresher course on the metal object found next to the engraved walls at Kariong will assist in determining whether this shared point of residence is random or intentional. That pendant and we use this term as there was when first found then worn as jewellery until the clasp broke, a complete round circular metal opening for a chain to pass through. Original Elder, Aunty Minnie Mace, found this ancient relic beside the entrance to the ten-metre shaft found next to the three hundred engraved hieroglyphs. We suspect that Nefer-Ti-Ru, the son of the Pharaoh, was interred in that back shaft and that the artefact and femur bone Aunty Minnie found, was most likely dropped when the tomb was robbed or destroyed. Some will claim that this object is also due to a careless carry, but the analysis of the make-up of this rock not only dismisses a recent drop, but if going on the vacancies in this readout, looking any further on this planet seems a waste of time. To begin with, the percentages do not add up. Any aluminium alloy has at least 85% of that element before any other addition, this artefact measures ‘down’ to 73%. In maintaining that precedent, the balance is 3% copper and 24% “unknown.”(10) Not only is this combination beneath minimum standards, but almost one-quarter of the alloy is also unknown. The laboratory that worked on the artefact, is one of the most advanced and respected in the country and they cannot find any earthly comparison, and it too was found at thirty-three degrees south of the Equator, as was the ring at Hill End. Let’s begin with the only copper-cladded truth in this investigation, the ring is not a drop in. It was not accidentally misplaced at some time since the British came to this country. That just did not happen, and we need to move past that point of pure fiction. The facts are unequivocal, the metal is thousands of years old and perhaps a lot more. The ring has been biding its time for tens of thousands of years on a hill near the Hill End goldfields, waiting. But for who, and what? That is certainly a work in motion and some progress has been made. As to its intentions and legacy, all we can say is that the chances are high a ring of this content, bearing these symbols, is the province of a woman of extremely high standing, a priestess or Cleito herself would qualify, but we seriously doubt it descends past that upper female rung. 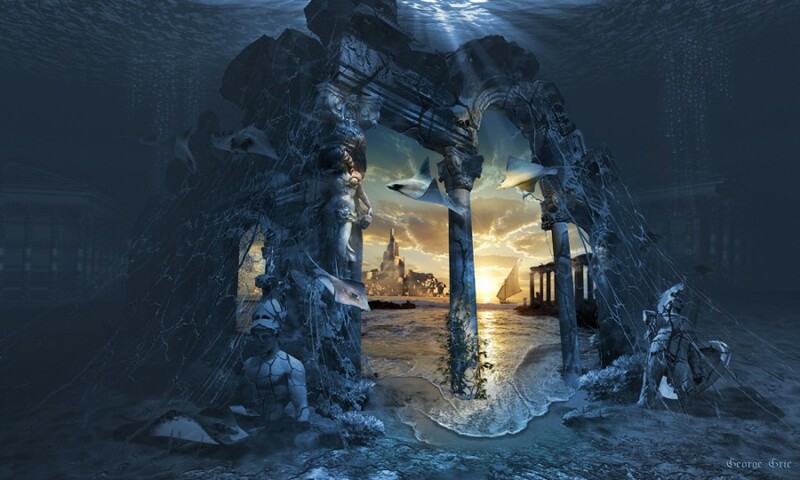 We do not doubt Atlantis did exist in some form and its heritage is a mixed blessing, as the empire imploded from within. Whether this ring contains some, all or none of these ancient insights and mistakes is debatable and still unknown. Some would say it is just metal, inert, inanimate and totally unknowing, others would reach for the stars, and we sit somewhere in between. But if pressed for a position on this fence, we suspect that there is magic afoot and a place for this ring of seminal importance in the immediate days ahead. Or maybe, it is just an alloy of copper and zinc that sits on a finger doing and waiting for nothing? Only time will tell, but why is it that four no-forehead skulls were found in Australia recently, and now the ring turns up? Not long before that, the Standing Stones archaeological notes were discovered and throughout all of these events, close to two hundred sacred rocks are now under our custodianship. There is a pattern and Spirits at play directing all of this Original business. And because of this renaissance and convergence of Old Way truths, we are certain that this ring is special, this ring is sacred, and this ring is back! (10) Graham Lancaster, Personal Communication.